Last night marked the jubilee edition of BarCamp Prishtina which gathered in Teatri Oda more than 130 participants who had the chance to hear three different stories of our guest speakers. The 20th edition of BarCamp Prishtina brought to barcampers three different stories which were shared by Alejtin Berisha, Adonis Berisha and Valmir Mustafa. Speaking on the importance of the education for a society the general director of Universum College, Alejtin Berisha, on the 20th edition of BarCamp Prishtina gave some important messages to the audience. “Education is the key toward a better economic development of a country. Each year the GDP of countries are increasing as a result of better education” he said. After giving his message that university is the place where people meet their future, Alejtin continued speaking on the opportunities that Universum has to offer, especially on the tech field. Both students at Universum College, Adonis Berisha and Donik Nika are whiz kids who have technology gadgets in their village in Klina out of every day used electronics. They were technical students once in high school and now are doing bachelor in the same field. Impressive enough, they brought to BarCamp their innovative products which we are not used to see in Kosovo. Turning on a car with just a sms and a mouse designed to serve to people with disabilities were innovations which surprised the whole audience gathered in Oda Theatre. Last but not least, Valmir Mustafa was the one closing BarCamp. EYE Venture 2014 was the main focus of his presentation. 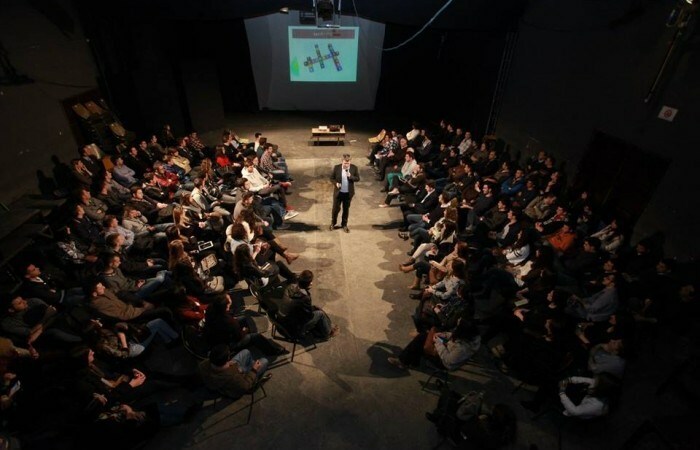 Being organized for the second time in Kosovo, EYE Venture gathers youth, students, and young entrepreneurs to establish new business companies in Kosovo. Speaking for the plans for 2014 edition, he revealed some details mostly oriented on what they are expecting for 2014 edition. “We are seeking for new sustainable and innovative ideas. Furthermore we want some healthy projects which will contribute to the higher good of society”, he explained.